Changing your RO/DI filters is one of those maintenance items that are super easy but a lot of us put off for far too long. This is unfortunate because not changing your filter frequently enough can not only lead to increased levels of contaiminents responsible for things like increased algae growth, but also more directly harmful things such as chlorine (as most folks don’t use a dechlorinator in RO/DI water as it isn’t necessary with good filters). 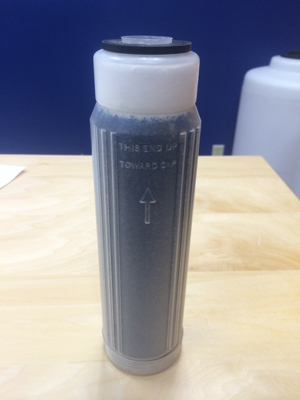 While a sediment filter will turn visibly dirty a carbon block that has reached its capacity and is no longer able to remove chlorine may look the same as they day it went in (or it may be filthy looking, it just depends on your water). If your system has a float valve or ball valve on the output side of the unit that was closed at the time you turned off the water, the system may still be under pressure. Closing a valve on the input side of the system while a valve is closed on the output side will trap the pressure into each side. Simply open the valve on the output side to release the pressure. Simply open the ball valve or push down on the float valve if it is in a container full of water. This should only take a moment and only a small amount of water will come out. 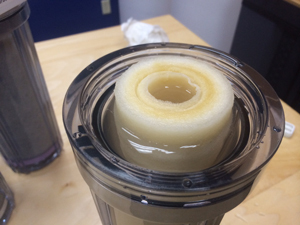 The sediment filter is the first filter on the left. 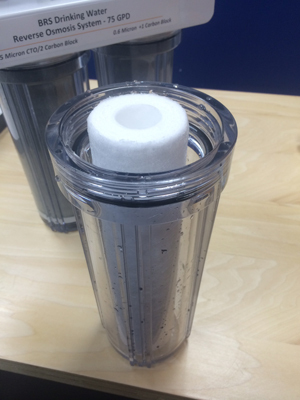 This is the first filter that water travels through and it removes free floating particles from the water. These are the little bits of rust, dirt, etc that are in your water. These collect in the filter which is why it goes from a nice white to looking dirty. The next filter in line will be the carbon block(s) of which you may have a single carbon block or two carbon blocks. If you have multiple carbon blocks they will go in order from largest micron size to smallest micron sizes (Generally a 5 micron first, followed by a 1 micron). Carbon blocks are used to remove things like chlorine (which is particularly damaging to the TFC membrane) as well as volatile organic compounds (pesticides from agricultural runoff for example). After you have your filters arranged it is time to place the filter wrench on the canister. The wrench slides on from the bottom and you want to slide the wrench as far up the canister as you can. The notches in the wrench will catch on the ridges of the canister as you rotate the wrench. Assuming you are looking at the unit from the front you should start off with the handle of the wrench rotated as far to your right as possible. The old adage “lefty loosy righty tighty” is still valid here but it can be easy to confuse because you’re often looking at it a little upside down. Next rotate the wrench to the left. Often a half of a turn with the wrench is all you need to get the canister loose; from there you can unthread the rest of the way by hand. The nice thing about the bottom mounting canisters is that when you remove them, the filter inside as well as the water will largely stay in the canister itself. You can then carry the canister to the sink and pour it out, or if you have a bucket handy just pour it into the bucket. Now you just need to open the packaging for the filter and place the new filter into the canister. 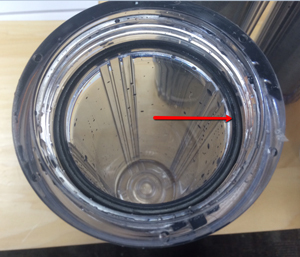 The new cartridge should be vertical and neither the sediment filter nor the carbon blocks have a correct orientation. There is no top or bottom with either. Before placing the canister back onto the RO/DI unit, double check and make sure the o-ring is properly seated in the canister. It should lay into a groove about an inch down from the top and not have any wrinkles in it. From here you just need to screw the canister back onto the ro/di unit. Installation is the opposite of removal. 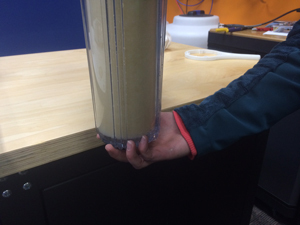 Thread the canister on by hand until it is snug, and then use the filter wrench to snug it up the rest of the way. The canisters have an o-ring in them to seal them so you don’t have to snug them up super tight, just firm (otherwise it’s going to be hard to get them off next time). 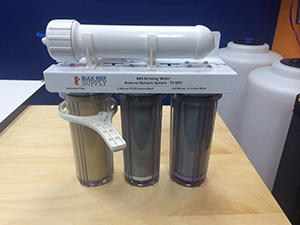 The process is identical for all of your pre-filters (sediment filters and carbon block(s)). 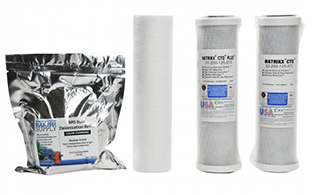 So repeat the previous steps on your carbon block(s) and you’re done with your pre-filters. The process for installing and removing the DI resin cartridge is the same but changing the DI media itself is a different process with this particular filter. DI resin is a loose media and the cartridge that houses it is opened up, the old media is replaced with new media and the cartridge is reinstalled. The process isn’t complicated but it is important to the get the DI packed in as tightly as possible. DI resin is actually made up of two different resins, a cation and an anion. If you look closely at the resin you can see that some of the beads are brown and some are blue. If the resin is not packed in sufficiently instead of remaining mixed they will separate out and the resin will not work properly. Once you have the DI resin cartridge removed unscrew the bottom cap and set aside. 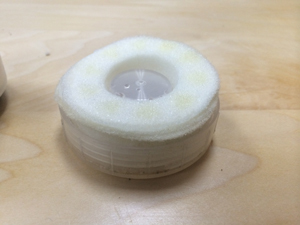 There is a small sponge between the cap and the DI resin, make sure you don’t accidentally throw it away! 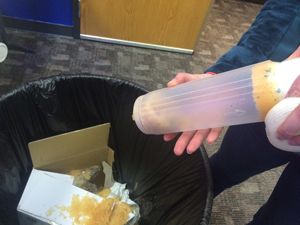 Then go ahead and discard the resin. 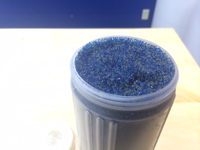 Open your bag of DI resin and fill the cartridge about 25% of the way. 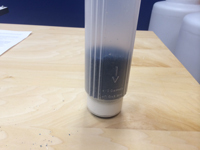 Tap the cartridge on your work surface 15-20x to settle the resin in as much as possible. Repeat this process filling the cartridge another ¼ of the way until the cartridge is full. Once full, scoop a little bit of the resin from around the edges out (this helps keep the resin out of the threads when you replace the cap), wipe any resin off the threads, place the foam ring on the resin, then add the cap and screw it on to secure it. Now it is time to install the cartridge back into the canister. The process is the same as the other cartridges with the exception that there is a correct orientation. 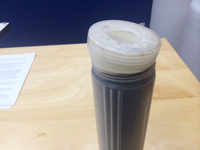 The DI cartridge should be placed in the canister with the cap at the bottom and the black plastic ring at the top. They also have an arrow that should be pointing up when installed. Then just screw the canister onto the system as normal.